Unisex winter pom pom hat. Bold four color stripe design. Luxurious shearling thermal band for extra warmth. Heavyweight multi yarn cable knit design. Hand wash only. 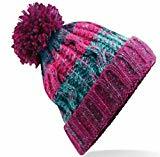 Unisex winter pom pom hat. Bold four color stripe design. Luxurious shearling thermal band for extra warmth. Heavyweight multi yarn cable knit design. Hand wash only. Fabric: 100% Soft-spun Acrylic.